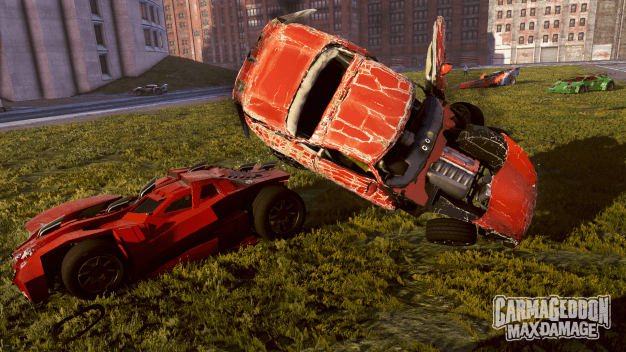 I really wanted to like Carmageddon: Max Damage. Even though I had not played any of its predecessors, after watching the trailer I requested to review it immediately. It looked so much like Twisted Metal, a game I could play for hours back in the day. Alas, I found myself disappointed. While Max Damage does indeed look and play similarly to my childhood game, it wasn’t nearly as fun. The trailer really shows off the game and its various game modes, so I was very excited when I started the tutorial. That’s when things went downhill. The game loads and I immediately discover the handling on my car is bad, so bad in fact that that it’s a pain to try and do anything other than accelerate and reverse. Forget having to turn or accomplish an event challenge. While this sounds like a minor inconvenience, trust me when I say it’s not. I used to live in Wisconsin; it gets cold up there. Lots of ice and snow makes driving in the winter especially dangerous. Your car can easily lose traction and spin out on even the smallest amount of snow. Driving in Carmageddon: Max Damage reminds me of that. A simple right turn would cause my car skid into a wall or maybe turn me around completely. It was frustrating and ruined the game for me. 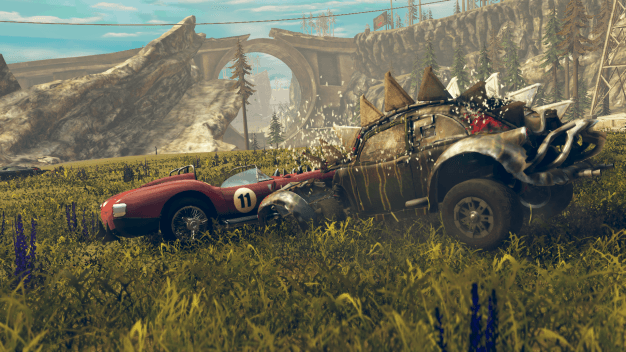 As you can imagine, a vehicular combat game really loses it appeal if you can barely control your own vehicle. And while I’m sure that out of the impressive 30 car collection Max Damage boasts, one of them is bound to have decent handling/traction. But I personally wouldn’t want to punish myself by trying to unlock it. Which is a shame, because the game does have it’s merits. Seven different game types (I don’t know why the trailer only listed six), 10 huge, open-world maps, over 90 different power-ups and online play. There’s even a gameplay option that allows you to change all the pedestrians to Hilary Clinton, Donald Trump or both! They’re just nigh impossible to enjoy…except maybe that last one. The Career Mode offers a variety of missions within it’s 16 different chapters. It’s in these missions where you unlock additional cars and car upgrades. In each mission, you’re tasked to complete one of seven different game types. Each Max Damage game type and its respective description can be found below. Caravans: It’s when you pull something behind you, such as a trailer or giant tank of gas, and use it to viciously murder innocent civilians in warped twisted mayhem. Car Crusher: Waste opponents to win points, but to avoid losing them again don’t get wasted yourself! Check Point Stampede: Beat opponents to checkpoints and win the game. Use fair means or foul to ensure you arrive first and achieve victory. 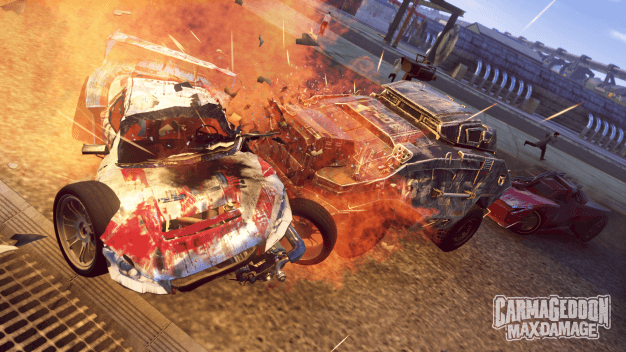 Classic Carma: Race, wreck or wreak havoc to win: Destroy all cars, kill all pedestrians or win the race. Combine all three for maximum mayhem! Death Race: The first player to complete the race wins, although devious drivers can steal laps from opponents by wrecking them! Fox ‘N’ Hounds: As the ‘fox’ you need to evade your ‘hound’ opponents until your timer reaches zero. You can’t stop, and the hounds never give up! Ped Chase: Kill the highlighted pedestrian first to get the point, then hurry to the next victim and repeat to win. While these game types sound fun and are very creative, not being able to drive properly strikes once again, making any of them a pain in the rear to complete successfully. The power-ups are also challenging to use (at first anyways), as no weapon, buff or debuff explains what it does. 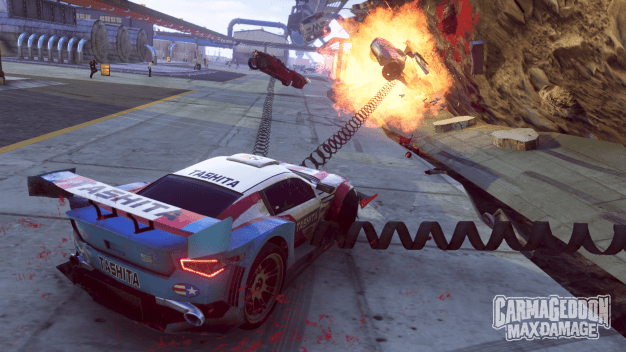 Career Mode aside, Max Damage also features a free play mode, online multiplayer, an action replay mode that lets you relive all your crashes at any angle, and a very unique car repair system. As you drive your car and inevitably damage it, you’ll also be earning points. These points can be spent on-the-fly to repair your car mid game. It’s a pretty cool concept and very satisfying to see your wrecked, p.o.s. car reassemble itself like Voltron. 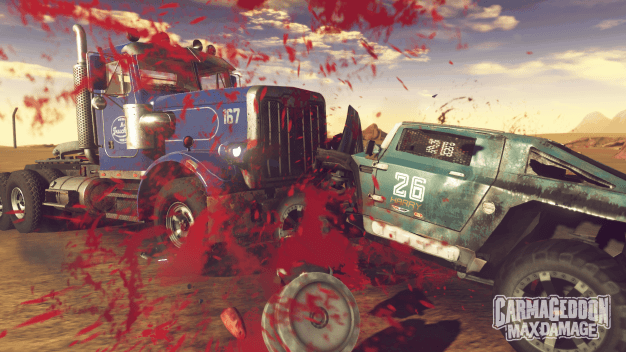 Carmageddon: Max Damage ends up being a vehicular combat game with difficult controls, last gen graphics and an overall forgettable gameplay experience. I can’t say I would recommend this game but to only the most loyal fans of the series. If you fall into that category however, you can pick up Carmegeddon: Max Damage on Steam for $29.99. Hopefully you’ll enjoy it more than I did. As for me, I’ll stick with Mario Kart or Twisted Metal.